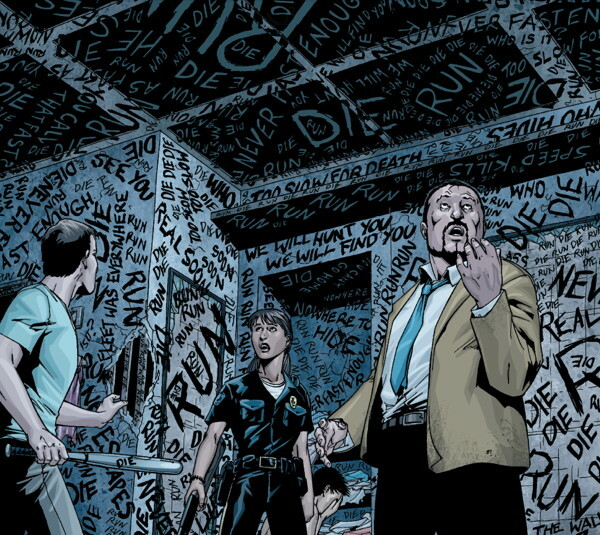 Last year, writer Gail Simone and artist Jim Calafiore took Kickstarter by storm, launching their first creator-owned title together through the crowd-funding website. Exceeding all expectations for support, the graphic novel flew out to fans everywhere that got the early buy-in. 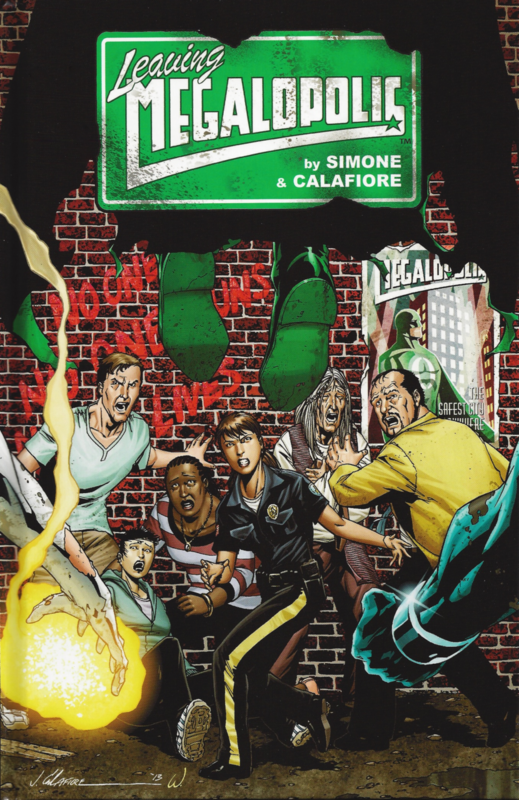 Now, Dark Horse Comics is offering those who missed out a chance to experience the gruesome fate of those in Leaving Megalopolis for themselves, with a new edition arriving in stores this September. Simone sat down with Comicosity to share her thoughts on the book’s success to date, and what the future might hold for this new world of characters. Matt Santori: Congratulations on the amazing success of Leaving Megalopolis, Gail! You and Jim clearly have amazing synergy together as creators, with your collaboration on Secret Six for DC Comics remaining one of the most missed aspects of that publishing line. What do you think is the secret to your success as a team? Gail Simone: I think that Jim has very thoughtful, great ideas, and he knows how to execute them well. He calls himself a frustrated director. By the time I write the scripts, and he does all the panel breakdowns and gets the visual storytelling going, it does feel a little bit more like a film than some comics. He really understands what it is that we’re trying to get across to the reader. He knows how to visually do that. Some scripts I might put more detail into than I would necessarily for Jim, because he doesn’t need a lot of stuff explained. MSG: You’ve spent an extensive amount of time creating and developing characters for the DC and Marvel Universes, but not done creator-owned work for many years. Why did this feel like the right time and how has the experience been different than you expected? GS: When I first started writing, I did Killer Princesses with co-creator Leah Hernandez, and also had a creator-owned series through Wildstorm called Welcome to Tranquility. But with Leaving Megalopolis, there was no publisher or editorial team. With the other two, we had those things through a publisher and editor, even though we were creating it. This project was something that Jim and I really wanted to take directly to the readers, and not have to worry about content. If we felt something was best for the story, we wanted to be able to do it that way, and we wanted complete ownership and control. We just wanted to do the best work we could do for this particular story. We’re really proud of it. I’ve had people come through the lines at conventions and say, “This is your darkest, but best work.” And that Jim was so amazing, and that we really saw a side of him that we didn’t get to see in Secret Six. So, I think it was a good choice for us to do this project. MSG: Right away, readers get their point of view character with Mina, the police officer. What went into developing her back story for you and why choose her as the main protagonist of this particular story? GS: We wanted to do a book that had real characters in it, that seemed grounded and would meet in your own town that you live in. We wanted to make this a narrowed-down, focused story about a small band of people just trying to get the hell out of Megalopolis. We have these incredible, large characters with super-powers, but we’ve seen stories told from their point of view. We really wanted to focus this down sharply on what it would be like just to get away from these powers gone crazy. And there’s nobody to come in to help rescue you, because they’ve all gone bad. You’re basically their prey, and they aren’t going to help you. So, the characters have to band together and use their own resources to try to survive. With Mina, we wanted a character that was strong, and could become stronger as the story went along. 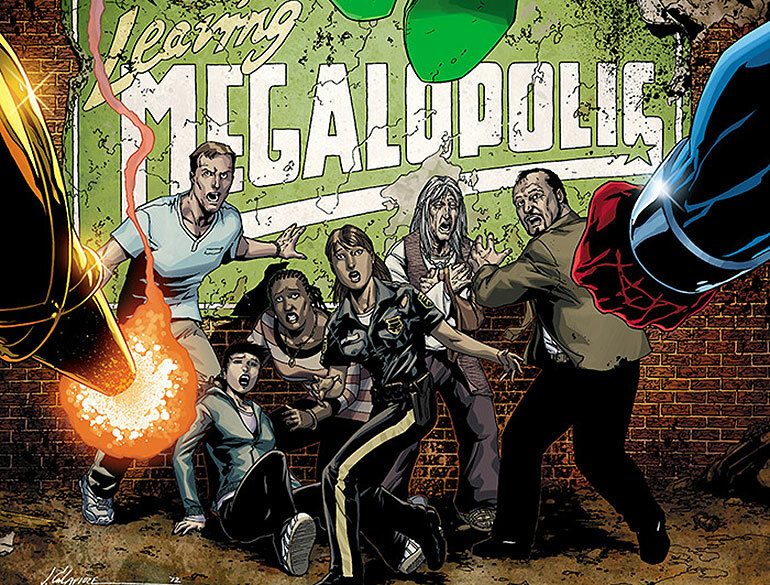 MSG: The premise of Leaving Megalopolis seems to offer limitless storytelling possibilities, from multiple angles — not just survivors, but victors and outsiders as well. How much of the world have you fleshed out in your head? GS: In my head, there’s quite a bit. And I agree, it’s an open enough concept that we can do a lot of different things with it. We could add suburbs if we want. It’s just really limitless in the types of stories we can tell in this world, and it’s really exciting to have that opportunity. Jim and I joke sometimes that we need to have Megalopolis library cards and we need to build a website that looks like a chamber of commerce site. So, we get really into the idea of this being a real place, and feeling very real. And working on it does feel real to us! MSG: Where do you take Leaving Megalopolis from here, especially now that the first volume will be receiving wide distribution through Dark Horse? GS: Jim and I are currently beginning work on the second volume, and discussing how that’s going to be published. We haven’t made any final decisions on that, but as soon as we do, we’ll start letting everybody know. And, of course, we’re hoping that people who missed the Kickstarter — or never even heard of the Kickstarter — will hear about it when Dark Horse releases it in September. Hopefully we can grow the audience a little bit, and get people excited about this town and these characters and what’s going to happen to them next. Because Jim and I have a lot of plans for what will happen next, and really hope we get to tell those stories. MSG: It seems like, more than ever before, creators are reaching out to fans for discussion and to hear about what really matters to them, and no creator does this as passionately as you, Gail. What do you think that interaction has brought to your work? GS: It has not only enriched my work and my storytelling, but it has enriched me in my personal life as well. I’ve met so many incredible people, from different walks of life with different experiences than I have had — and who have been so generous and willing to give of their time to share what it was like growing up, or their coming out stories. Or their struggle to even come out to themselves. Or what it was like growing up in a small town as the only “whatever” there. Or feeling invisible. Just all kinds of stories and experiences. Culturally, I am from a very isolated town in rural Oregon. Being able to talk to somebody in Singapore about what it’s like to be in Singapore — about the language, about the food, about their beliefs on things — while writing a story set in that location, is extremely valuable. It’s enriched myself, and the work, a lot. I can’t be everywhere and know everything personally. It’s just been great! MSG: Any last words or special teases you can share with the Comicosity audience about the future of Leaving Megalopolis or anything else you’re working on? 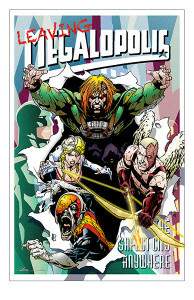 GS: With Leaving Megalopolis, like I said, Jim and I working on the second volume now. We’re not ready to release too much yet. Later on in 2014 and early 2015, I have some other projects coming out. I’m focusing on some other creator-owned stuff that we’ll talk about as that gets closer! 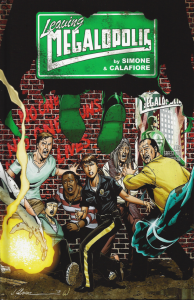 Previously only available via Kickstarter, Leaving Megalopolis Volume 1, written by Gail Simone and illustrated by Jim Calafiore, will be shipping to comic shops everywhere in September 2014 from Dark Horse Comics. Contact your shop today to reserve your copy!